Surely you have heard of the famous US National Museum female carcinologist, Mary Jane Rathbun, but there are a number of other female carcinologists who worked or were associated with the Museum that also deserve the stage light, most notably Harriet Richardson Searle, Mildred Stratton Wilson, and Isabel Canet Pérez Farfante. Harriet Richardson Searle was known as the First Lady of Isopods, and one of the earliest woman carcinologists (Mary Jane Rathbun preceded her by only 5 years!). With a career spanning more than 20 years and 80 publications, very little is known about her. Richardson was born on 9 May 1874 in Washington, DC. She obtained her B.A. (1896) and Master’s (1901) degrees from Vassar College at Poughkeepsie, New York, and her Ph.D. (1903) from Columbian University (now George Washington University), Washington, DC. Richardson focused her research on isopod systematics, with her first publication in 1897 on the Socorro Isopod, Thermosphaeroma thermophilum. This thermal water isopod, endemic to Sedillo Spring in Socorro County, NM, is now on the IUCN Red List of Threatened Species. Her Ph.D. dissertation was a 266-page “Contributions to the Natural History of the Isopoda” containing information on a miscellany of isopods in the Museum’s collections. Her association with the US National Museum (now National Museum of Natural History) began in 1896, and in 1901 was appointed Collaborator in the Division of Marine Invertebrates. In 1952 she was given the museum title of Research Associate. She worked at the museum for over 20 years, all unpaid, describing over 70 new genera and 300 new species of isopods and tanaids. Her best known work, “A monograph on the isopods of North America” (1905, reprinted 1972), is an overview of isopod systematics, literature, distributions, and habits of all the species (terrestrial, freshwater, and marine) that is still used today. Her research material expanded beyond the U.S. National Museum. Richardson wrote reports in foreign publications, including materials from the National Museum of Natural History, Paris and the Rothschild collections from East Africa. She also wrote some of her papers in French. She was honored by many contemporaries with a number of isopod species named after her. Soon after marrying in 1913, Richardson’s research work diminished; her last publication was in 1922. Harriet Richardson Searle was a member of the Biological Society of Washington, and the Washington Academy of Sciences, and the Washington Society of Fine Arts. Richardson was also an active member of the Daughters of the American Revolution where she was Regent of the Captain Molly Pitcher Chapter (1914-15). She died on 28 March 1958 and is buried in Arlington National Cemetery with her husband and son. Wilson was born in Seaside, Oregon on 25 April 1909. She obtained her B.A. with honors from the University of California, Berkeley, in 1938, and then joined her husband in Washington, D.C. With a letter from her professor, S.F. Light, Wilson was introduced to W.L. Schmitt at the U.S. National Museum (USNM) where she continued work on freshwater copepods. Her studies of C. Dwight Marsh’s collections as well as her own resulted in major publications on the revision of North American diaptomids. At the USNM she was appointed Assistant Curator (1944-46) during WWII, and was in charge of the Division of Marine Invertebrates. In 1946 she moved to Alaska with her husband, but continued her freshwater copepod work and association with the USNM as honorary Collaborator in Copepod Crustaceans, and in 1960 she was appointed Research Associate, Division of Crustacea. Mildred Stratton Wilsoncontributed greatly to the knowledge of the genus Diaptomus, harpacticoids, and caligoids, among others. She was a woman of remarkable talent and strength of character. She would often conduct her research in home laboratories, working on her own collections from Alaska using a specialized net she and her husband devised. Despite much hardship and physical disadvantages due to poor health, she continued with her studies until her death in 1973. Isa, as she was affectionately called, was born on 24 July 1916 in La Habana, Cuba, and received her undergraduate training at the University of Havana. She served as professor of biology at the Instituto de La Vbora and assistant professor of zoology at the University of Havana until 1942. She attended Radcliffe College of Harvard University where she obtained a master’s degree in biology in 1944, followed by a doctorate in 1948. Isa was one of the first women to attend Harvard University, and was the first Cuban woman to earn a doctoral degree from an Ivy League Institution. Returning to Havana, she served as professor and researcher of zoology at the University of Havana until 1960. After leaving Cuba with just a suitcase, Isa joined the US Fish and Wildlife Service in 1961 as a researcher in charge of commercial shrimps in US waters. She was also an Associate in Invertebrate Zoology at the Museum of Comparative Zoology (MCZ) at Harvard University from 1961 to 1969. In 1966 she joined the National Marine Fisheries Service (NMFS) as Systematic Zoologist at the NMFS Systematic Laboratory in the National Museum of Natural History, Smithsonian Institution, in Washington, D.C. until her retirement in 1986. From 1987-1997 she was a Research Associate in the NMNH Division of Crustacea. Isa authored zoology textbooks, and numerous papers on the systematics and reproductive morphology of penaeoid shrimps, most notably landmark studies of the commercial genus Penaeus. She was a senior author of the book “Penaeoid and sergestoid shrimps and prawns of the world” (1997). Isabel Pérez Farfante's name is synonymous with penaeiod systematics. Her keys and descriptions of penaeid genera are still considered essential references today. Bauer, R. T. 2010. Isabel Pérez Farfante de Canet 24 June 1916-20 August 2009. J. Crust. Biol., 30(2): 345-349. Damkaer, D. 1988. Mildred Stratton Wilson, Copepodologist (1909-1973). J. Crust. Biol. 8(1): 131-146. Damkaer, D. 2000. Harriet Richardson (1874-1958), First Lady of Isopods. J. Crust. Biol. 20(4): 803–811. McLaughlin, P. A., and S. Gilchrist. 1993. Women’s contributions to carcinology. History of Carcinology.— Crustacean Issues 8: 165–206. Someone made the following comment upon reading the abstract of one of my recently published papers (led by Lucília Souza Miranda): "this claustrum paper just about lost me with its first sentence in the Abstract". It is definitely true that sometimes our scientific papers can be rather esoteric. This is all the more true of an abstract, which is properly meant to be a "retelling" of a paper rather than a summary. "The claustrum in Cnidaria is a tissue in the gastrovascular cavity delimited by a central layer of mesoglea surrounded by gastrodermis (i.e., gastrodermis-mesoglea-gastrodermis), without communication with epidermis." In re-reading this sentence, it seems a fair assessment. And indeed, in running the entire abstract through a "Readability Consensus Calculator", the consensus view is pretty clear: VERY DIFFICULT TO READ. Point taken. So here is an attempt at getting the same information as in our abstract across using alternative language. One caveat: No doubt the language is stereotypical, inaccurate, and/or outdated. I can claim no authenticity for it. But do you get it? Is the alternative more clear than the actual? So, like there is this hella cool thing in jellyfish, a piece of gut, yeah? This thing is called claustra and it’s really four different things, each one a claustrum. They grow, like, inside out from walls in the stomach and become totally new walls breaking the stomach into parts. If you zoom in way close, they have jelly-like stuff surrounded by gut tissues on both sides, and they do not connect to the outer skin (your epidermis is showing--jk). And this claustrum's been used to tryna suggest that two different kinds of jellyfishes, the square and hurtful box jellies and the beautifulest stalked ones, are closely related. But it’s totally bogus to accept that box jellies and stalked jellies both have claustra because, like, it's never really been looked at that carefully. But like we did that. Yeah. And the results are whacked. Actually, it’s like hella cool! Only the stalked guys have claustra, and just some of them at that. What some old dudes (gender-neutral) messed up was that box jellies don’t have claustra. They got these holes in their gut, though, near their throat, and that threw the brainiacs off. Cool thing though, stalked jellies also have those holes! I know, right? So, box and stalked jellies don’t share claustra but they do share gut holes. And by the way, it’s just dope to look at a fossil and think you can make out a claustrum in it. The claustrum in Cnidaria is a tissue in the gastrovascular cavity delimited by a central layer of mesoglea surrounded by gastrodermis (i.e., gastrodermis-mesoglea-gastrodermis), without communication with epidermis. By dividing the gastrovascular cavity, the four claustra provide an additional level of complexity. The presence of claustra in Cubozoa and Staurozoa has been used as evidence supporting a close relationship between these two cnidarian classes. However, the detailed anatomy of the claustrum has never been comparatively analyzed, rendering the evolution of this character among Cnidaria and its homology in Staurozoa and Cubozoa uncertain. This study provides a comparative investigation of the internal anatomy of the claustrum in Staurozoa and Cubozoa, addressing its evolutionary history based on recent phylogenetic hypotheses for Cnidaria. We conclude that the claustrum is a character exclusive to some species of Staurozoa, with a homoplastic evolution in the class, and that the structure called the “claustrum” in Cubozoa corresponds to the valve of gastric ostium, a structure at the base of the manubrium, which is also present in Staurozoa with and without claustrum. Thus, the claustrum cannot be a synapomorphy of a hypothetical clade uniting Staurozoa and Cubozoa, nor can its hypothetical presence in enigmatic fossils be used to support cubozoan affinities. And since a picture tells a thousand words (much longer than your typical abstract), here is a diagram that compares species of stalked medusa without and with a claustum. We do not know for certain what the function of the claustrum is, but it does provide a space (pr-principal radial pockets, also known as mesogons or main radial pockets) where the gonads can be separated from the rest of the gut. Comparison of stalked medusa without (left) and with (right) a claustrum (CS), logitudinal section at the perradii. Abbreviations: an-anchor/primary tentacle, mn-manubrium, gp-gastric radial pocket, pe-peduncle, gf-gastric filaments, gd-gonad, pr-principal radial pocket, ar-accessory radial pocket, and CS-claustrum. Histological transverse cross section through a stalked medusa (Staurozoa) that has a claustrum. The claustrum is marked CS. Other abbreviations: gd-gonad, ar-accessory radial pocket, in-infundibulum, and sp-septum. Or you can contact any of the authors to request a PDF copy of the paper. The Department of Invertebrate Zoology (IZ) holds a unique collection of more than 400 portraits of influential scientists that have worked on crustaceans (carcinologists) from Aristotle to the present. Accompanying the portraits are biographical files that contain valuable information on their life and works. This collection has been painstakingly gathered by various IZ curators, with help of outside colleagues, over many decades, and holds valuable information for biologists and historians of science. The portraits consist of large format photographs and negatives, as well as line drawings (some original), and many were framed and exhibited on the hall walls of IZ, each with a brief biographical summary. This collection exhibited on the halls of IZ floors on the West Wing of the Natural History building was originally called the “Rogue Gallery”. The biographical files are stored in acid-free reprint boxes and contain original obituaries or copies of biographies, photographs and slides, and in some cases, news clippings and/or unpublished notes on life aspects of the scientists. Given the size and importance of this collection, all components were scanned and digitized over the last decade with the help of several hard working student interns. In a digitized format, this unique resource is accessible to researchers and interested users around the world, and eventually will be posted online. With downsizing and renovation of the Natural History building (NHB), the “Gallery” exhibit was removed from the walls and moved to for temporary storage at the Museum Support Center (MSC, Suitland, MD). The portraits were wrapped and packed into storage bins to await their next showing. Fast forward 4 years (and 2 moves), the “Gallery” once again is up and gracing the walls of the Department of Invertebrate Zoology at NHB. Drs. Rafael Lemaitre and Stephen Cairns were instrumental in making this happen. Dr. Cairns assisted with selection and placement of the portraits. A small selection of portraits and corresponding biographies is presented here. Just a few of the storage bins packed with framed portraits and ready for delivery to NHB. Selecting and moving Gallery portraits from MSC to NHB. Dr. Cairns holds a portrait of Dr. Paul Illg destined to be hung outside Dr. Jon Norenburg’s office at NHB, by request. Professor of Zoology, University of Washington. Had an illustrious career in life sciences, and contributed to making his University’s Seattle campus and Friday Harbor Laboratories, one of the leading institutions in the world for studying marine zoology, especially invertebrates. Published prodigiously for more than 50 years on parasitic copepods, particularly those living in ascidians. His research on microscopic ascidicolous copepods greatly extended biological and taxonomic knowledge, and illuminated evolutionary processes in these extremely complex parasitic crustaceans. His work is without equal in the systematics literature. Arranging the portraits after they arrived back to the halls of IZ at NHB. Received his BS from the University of Miami, and MS (1954) and PhD (1958) from George Washington University. Published over 130 papers and books on the taxonomy and natural history of soft corals, describing over 170 new species, 40 genera, and three new families. Species from different groups of animals have been named in his honor, including the hydroid Hydractinia bayeri, described by the Emperor of Japan, Hirohito. A curator at the Smithsonian Institution (1975 until retirement in 1996); emeritus researcher until 2006. Not a carcinologist, but an outstanding bio-illustrator, he was tasked to create detailed water color sketches of color patterns of live Trapezia, coral reef crabs. These sketches and associated field notes are now part of the Illustration Archives of the Department of Invertebrate Zoology, and have become extremely useful for modern revisionary taxonomic studies of these spectacular and ecologically important reef crabs. French anatomist considered the founder of the sciences of comparative anatomy and paleontology. Worked at the Museum of Natural History, Paris. Was Chancellor of the University of Paris, and served in the cabinet of Louis XVIII. An antievolutionist, he became the most eminent European scientist of his time, and virtually an intellectual dictator in the field of biology. Perfected the animal classification system of Linnaeus by grouping related classes into broader groups he called phyla: Vertebrata, Mollusca, Articulata (jointed animals), and Radiata (everything else). In doing so he stressed internal structures as indicative of relationships, rather than external features. Made important collections of crustaceans and published on groups such as the isopods. His participation as naturalist in the 5-year voyage of exploration of the H.M.S. “Beagle” (1831-1836) made this expedition the most important in the history of biology. His observations led him to propose in 1858 (jointly with A.R. Wallace) the famous theory of evolution, detailed in “The Origin of Species” (1859). Began work on barnacles in 1846, and intensively studied their larval development, metamorphosis and adult morphology. His 4-volume work on living and fossil barnacles (1851,1852,1854,1855) elucidated their affinities, functional morphology, and evolution, establishing a classification still used today. A painstaking perfectionist in collecting and classifying his information, he was a man of independent means. Member of The Geological Society of London. Head chair of Crustacea, Arachnida and Insecta, and also of Mammals and Birds, Muséum national d’Histoire naturelle, Paris. Great French morphologist and classifier. Best known for his multi-volume work considered the first breviary of carcinologists: “Histoire naturelle des Crustacés” (1834-1840), where he named 1400 species and 350 genera. First to propose idea that the crustacean body is arranged in series of homologous segments each with a pair of appendages. French carcinologist, succeeded his father (H. Milne Edwards) as chair of Mammals and Birds, and became director of the Muséum national d’Histoire naturelle, Paris. Studied fossil crustaceans, and published many works documenting the diversity and morphology of decapods, mostly Brachyura and Anomura, from classic exploratory expeditions conducted on ships such as the "Travailleur", "Talisman", and the "Blake". Professor, Yale College. One of the first professional American scientists. Attained the rank of zoologist, then leaving this for geology, his chief field. Became known in 1836 with a treatise on mineralogy, followed by a series of short papers on copepods. Geologist and Zoologist of the “U.S. Exploring Expedition” (1838-1842), one of the great events in the history of science in the United States. In his monumental work “Report on the Crustacea” (1853-1855), described hundreds of new species, and presented a philosophical treatment of the classification, relationships, and distributions of species. Editor for 50 years of “The American Journal of Science”, and founder of the National Academy of Science. Classic carcinologists: Georges Cuvier, Charles Darwin, Henri Milne Edwards, Alphonse Milne-Edwards, James Dwight Dana. Modern day carcinologists at the National Museum of Natural History: Austin Beatty Williams, Thomas Elliot Bowman, Isabel C. Pérez Farfante, and Fenner Albert Chace, Jr.
Research Scientist, Systematics Laboratory, National Marine Fisheries Service, based at the National Museum of Natural History, Smithsonian Institution. Obtained his Ph.D (1951) at the University of Kansas, studying Ozark crayfishes. His numerous publications covered the taxonomy, systematics, biogeography, and evolution of various decapod groups, both Fossil and Recent. Best known for his invaluable and widely used "Marine decapod crustaceans of the Carolinas" (1965), and its later expanded version "Shrimps, lobsters, and crabs of the Atlantic coast of the eastern United States" (1984). He was co-founder and president (1983-1985) of the Estuarine Research Federation, and was an active member of The Crustacean Society, and the Biological Society of Washington, among others. Curator, Department of Invertebrate Zoology, National Museum of Natural History, Smithsonian Institution. Produced 163 papers on isopods, copepods, amphipods, mysids, and mictaceans. His mastery of crustacean comparative anatomy and morphology led him to produce classic, provocative studies such as on structural homology of the telson and on the evolution of stalked eyes. Zoologist Emeritus, National Museum of Natural History, Smithsonian Institution. Born in Fall River, Massachusetts. Obtained his Ph.D. in 1934 from Harvard University. He was Assistant Curator of Invertebrates (1934-1942) and Curator of Crustacea (1942-1046), at the Museum of Comparative Zoology, Harvard University. Joined the staff of the U.S. National Museum* in 1946 where he worked until his retirement in 1978. He then completed his 7-part study of the caridean shrimps from the “Albatross” Philippines expeditions (1907-1910), published in Smithsonian Contributions to Zoology between 1983 and 1997. His interests centered primarily on caridean shrimps, and he is considered by his peers as one of the most influential and respected specialists on caridean shrimps in the latter half of the 20th century. Ascended from “copyist” to assistant curator in charge of the Department of Marine Invertebrates, U.S. National Museum. Prodigiously productive, considerably advanced knowledge of fossil and Recent decapod crustaceans of the world, describing 1147 new species, 63 genera, and 5 higher categories. Best known for her unparalleled, monumental 4-volume monograph of New World brachyuran crabs, and a treatise on freshwater crabs. Head curator, Department of Zoology, U.S. National Museum. Succeeded M.J. Rathbun. His tireless collecting efforts during numerous expeditions worldwide led to the immense holdings of the national collections. His dedication to the advancement of invertebrate systematic zoology contributed to the unmatched growth and international recognition of the Department. Author of numerous taxonomic studies on decapods and stomatopods, and the popular book "Crustaceans" (1st printed 1931). Senior Zoologist, Department of Invertebrate Zoology, National Museum of Natural History, Smithsonian Institution, Washington, D.C. Earned his BS (1956), MS (1959), and PhD (1963) from the University of Miami. He published 278 papers on stomatopods and decapods, including landmark monographs and other studies on West African crabs, Indo-pacific dorippids, commercial geryonids, cave shrimps, and callianassids. Above all, he was a master in stomatopods, and increased the known species from a handful to nearly 500 worldwide. In all, he named 279 species, 138 genera, 5 subfamilies, 19 families, and 3 superfamilies of extant decapods and stomatopods, and at least 15 genera and 27 species of fossil decapods. A tireless collector, he obtained more than 50,000 decapod and stomatopods for the Museum and other institutions. One of the founders, and first President (1981-1983) of The Crustacean Society, from which he received in 1999 the “Excellence in Research Award”. Greek philosopher, founder of zoology and natural history. Organisms we now call crustaceans (decapods, stomatopods, copepods) can be identified in his “Historia Animalium” under the account of “bloodless” animals. His description of 180 different Aegean Sea animals is the precursor of all subsequent publications in marine biology. Artist-naturalist, born in the imperial city of Frankfurt am Main. She was not only skilled in watercolor and oils, but also was a keen observer of habits of caterpillars, flies, spiders, and other creatures. Her most famous works are her “Raupen”, and after traveling to America, her “Metamorphosis of the Insects of Suriname”, and “European Insects”, which include exquisite plates depicting life stages of insects. She can be hailed as the first woman carcinologist as she prepared 60 crustacean paintings for Georg Everard Rumpf’s (Rumphius) 1705 book on the crustaceans from Amboina. French naturalist. Took a long time finding himself. As a soldier he fought with distinction in the Seven Years’ War. In 1781 he was appointed botanist to the king, and in 1793 (at nearly 50 years of age) professor of zoology at the Museum of Natural History in Paris, at which time he came into his own. Between 1815 and 1822 he produced the gigantic 7-volume work “Histoire naturelle des animaux sans vertèbres” which founded modern zoology. He coined the terms “vertebrate”, “invertebrate”, and “biology”. In his book “Philosophie Zoologique” he was the first biologist of rank to rationalize the evolutionary development of life. Unappreciated and often maligned in his time, he died blind and penniless. Born in Constantinople, Turkey, into a French-German family. He privately studied natural sciences, medicine and mapmaking. He was an eccentric, perhaps unbalanced man, but his intellectual breadth was enormous. A keen naturalist, nearly every one of his 900+ publications is rare, appearing in obscure places or journals. His carcinological work focused on the faunas of Sicily and the eastern U.S. Most of the numerous crustacean names he proposed never attained taxonomic status because of faulty descriptions, lack of illustrations, and his practice of not keeping specimens. His work was unfairly ignored or minimized by contemporaries. He died in poverty and isolation in Philadelphia, and his collections and books sold as junk. In early years he used the name Rafinesque-Schmaltz. In June 2016 we received a request from William Langford of Plattsmouth, Nebraska for a photograph of shells that were donated to the museum by his grandfather (Daniel Boone Langford) during the first half of the 20th century. William recalled visiting IZ and seeing some of these specimens 44 years ago. His grandfather was a shell collector whose knowledge of the Pacific Island reefs and beaches (acquired in part through his fieldwork) was so extensive that the United States Navy employed him as a civilian expert to assist with the planning of the amphibious invasion of Okinawa during WWII (see W.J. Holmes, Double Edge Secrets, U.S. Naval Intelligence Operations in the Pacific During WWII, Naval Institute Press, 2012). Daniel Langford, who passed away in 1954, discovered a number of new mollusk species, several of which were named after him by Smithsonian curators (including William Healy Dall) and other malacologists. We assembled a plate with images of some of these species and sent photographic copies to William Langford and his two sons. Many thanks to volunteer Nick Raymond, and Yolanda Villacampa for taking the photographs of these specimens. Selection of shells collected by Daniel Boone Langford. For those who are interested, some of the details of Daniel Langford’s life can be found in Harald Rehder’s memorial sketch of Langford’s friend and brother in law Ditlev Thaanum, who was also a well-known Pacific shell collector. A couple of days ago, the Echinoblog (by IZ's Chris Mah) posted this wonderful picture of a withdrawn sea anemone in the family Aliciidae from a recent Okeanos Explorer Dive observed on Ahyi Seamount in the Mariana Islands region at 275 meters. 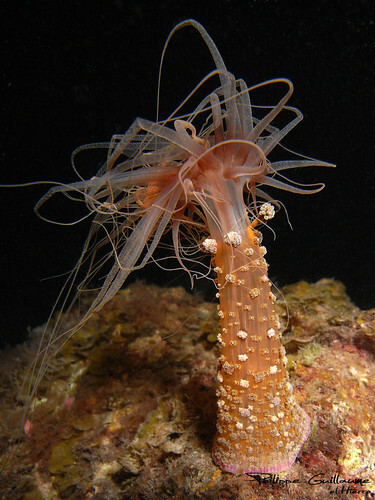 A seldom seen sea anemone in the family Aliciidae, with its lengthy tentacles withdrawn. Captured on film by NOAA's Okeanos Explorer. Dr. Dave Pawson, Curator Emeritus has apparently encountered these sea anemones before! Upon reading Chris' Echinoblog post on the recent Okeanos observations, he shared a “real world” encounter with an aliciid anemone in the Atlantic. "We picked up one of those in the Bahamas years ago…a small animal that was about 6 inches long when we laid it out in a dish on the mother ship, but when in situ, the tentacles extended out about 1.5 meters! We were looking at this weird animal in the dish, and wondered what the scattered knobby structures were on the body. Could they be “buds” – was the animal reproducing asexually? I touched one of the knobs with a fingertip, and received a jolt that felt like a million volts of electricity! The knobs were masses of nematocysts (stinging cells). My fingertip was very painful for some hours, but it survived; in in fact I’m typing this e-mail with it, in my usual two-fingered manner." Below is a fantastic picture by Philippe Guillaume of a similar-looking aliciid anemone with tentacles extended. Explore his Flickr page for additional images. Nudibranchs are colorful marine slugs that are found in almost all shallow water areas around the world. Sadly, they cannot enjoy the beautiful colors and patterns that they have, because their eyes do not allow them to see in the same way humans (and many other animals) do. This leads to a few questions. Since they can't see the color patterns, what exactly can their eyes do? What do these slugs use their eyes for? And finally, are there other ways they can sense their environment? They have to get around somehow, right? Nudibranch eyes are located on the head, just at the base of structures called rhinophores (we'll look at these in more detail in a bit). They are extremely small, and as such are difficult to see in photographs (you can see a couple on this Sea Slug Forum page: www.seaslugforum.net/find/2377). From research that has been done in the past on eyes in nudibranchs, we know that the eyes are primarily used in a very simple way, to detect dark and light. Once they sense a change in the light intensity, nudibranchs exhibit a behavior called phototaxis, referring to the movement of an organism toward or away from a light stimulus. Whether they move toward or away depends on the species, since some are active during the day (move toward the light) and others at night (move away from the light). While it is possible that these slugs use their eyes to detect the shadow of predators, it is more likely that their eyes are primarily their way of keeping their internal clock tuned to day and night. Since they can't see beyond being able to distinguish light and dark, how do nudibranchs find food or avoid predators? This is done primarily by use of rhinophores (See below) and oral and/or propodial tentacles (See below), additional structures that these animals possess that allow them to sense chemical changes in the water. The rhinophores (aka the nose of the nudibranch) come out of the top of the head of the slug and look a lot like antennae in insects. These structures have special receptors that allow the nudibranch to sense chemical cues in the water, enabling them to find food and avoid predators. Oral and propodial tentacles, however, are more like hands. These structures act as feelers, allowing the slugs to touch the environment around them and determine if the direction they are moving is safe, or if they need to change their path. Glossodoris symmetricus from Papua New Guinea, with the red rhinophores indicated by a white arrow. Caloria indica from Papua New Guinea. The white arrows indicate the oral and propodial tentacles. Though nudibranchs can't see very well, this is obviously not a detriment to their ability to survive. These slugs have evolved multiple adaptations (rhinophores, oral tentacles and propodial tentacles) that allow them to sense their environment, and they have done very well for themselves. So, while we enjoy the beautiful color patterns that these slugs have, we should also admire the amazing adaptations that they have in order to perceive their environment. For more information on (and pictures of) nudibranch rhinophores, see the Sea Slug Forum’s rhinophore page.